Our garden staff has been planting annual and perennial flowers for the last four weeks. 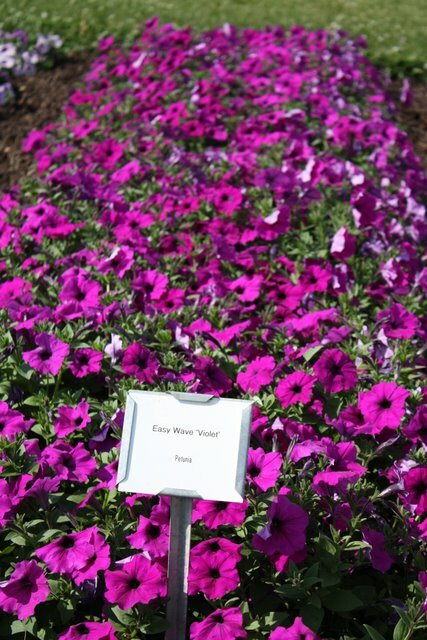 We have planted over 420 different varieties of annual flowers – yes, that number is 420. Angelonis, Coleus, Diascia, Petunias and many additional annuals fill 15 large beds with dramatic shapes and colors. Pinks, purples, lime-greens and black flowers glow with vibrant new shades rarely seen in the plant world. A new black petunia that is not on the market, and only being displayed in a few display gardens this year, can be found peaking out of pots and growing in one of our 16 annual flower beds, joined with chartreuse sweet potato vines, and lime-green zinnias. Have fun searching for the “Black Velvet” petunia. Our collection also includes the largest trial of geraniums found in the United States. Over 96 varieties of geraniums or Pelargoniums is on display. We are working with the Commercial Flower Growers of Wisconsin to feature as many gernaiums as we can trial in our gardens. The gardens are open from dawn-to-dusk, seven days a week. Entrance is free, though we do request a small donation. The garden is funded through donations and grants – not University funds. Student interns and a garden manager are paid through the donations and grants we secure each year.